With over half the Adventure’s crew killed, and their leader lying motionless, the remaining pirates threw down their weapons and cried for mercy. Several made their escape by leaping over the side and swimming ashore. Down in the hold of the Adventure, another struggle had been going on. One of the crew members, a black man by the name of Caesar, had been ordered to station himself at the door leading into the powder magazine. If Maynard’s men were able to take the ship, Blackbeard had ordered Caesar to blow it up. A planter seized the night before and held prisoner during the fight, overpowered him before he could set off the explosives. Nine pirates lay dead, sprawled on the deck of Maynard’s sloop near the body of their captain. All nine of the survivors were wounded. Of Maynard’s crew, ten had been killed. Another 24 were wounded, one of whom later died. A search of Blackbeard’s belongings revealed several interesting items. There were a number of letters, including several from prominent New York merchants. There was another which began “My Friend,” and which was signed “T. Knight.” This communication from the governor’s secretary contained a veiled warning and indicated that Governor Eden would welcome a visit from the pirate. There was also a very revealing account book of the disposition of the loot taken by Blackbeard. 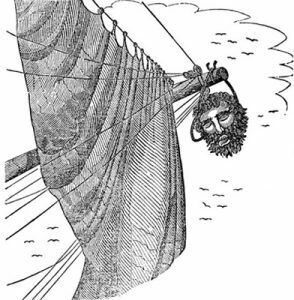 After searching the pirate’s belongings, Maynard severed Blackbeard’s head from the shattered body. This grisly trophy was then suspended beneath the bowsprit of the sloop. Sails were hoisted and the course was steered for Bath. Here the letter from Knight to Blackbeard was delivered to Captain Brand. The captain had already contacted Maurice Moore and Captain Jeremiah Vail who had shown him Tobias Knight’s barn in which much of the pirate booty had been stored. When Knight was accused by Brand of having these goods, the secretary professed that he knew nothing of what he was talking about. He began to weaken when he was shown the pirate’s account book. When Governor Eden was shown the evidence, he could do nothing to protect his secretary and issued the necessary orders permitting a search of the barn. Concealed under the hay were found 140 barrels of cocoa and one cask of sugar. Knight then changed his pretense and now said that he had known the loot was there, but he had merely been storing the goods there for Blackbeard, who he had thought was now a respectable tradesman. It was even suggested that some of the articles found in Knight’s barn belonged to Governor Eden. Nevertheless, all were removed and placed aboard the ships under Brand’s command. Six other pirates, including the lame Israel Hands, were also picked up in Bath. Then, with the pirate booty on board, and with Blackbeard’s head still dangling from the bowsprit of the sloop, Maynard and Brand sailed back to Virginia. This incident led to quite a dispute between the governments of North Carolina and Virginia. Governor Eden, especially after he discovered that his share of the pirate goods had been taken away along with that of Knight, lodged a vigorous protest with Governor Spotswood. He justified his objections on the grounds that Spotswood had exceeded his authority in the invasion of North Carolina waters. He demands that the captured pirates be returned to North Carolina for trial. Yet he had made no such demands upon Governor Johnson of South Carolina who, in like manner, had been responsible for the capture of Stede Bonnet in North Carolina waters. Moseley and Moore did not get off so easily. Both were brought to trial before the General Court and both were found guilty. Moore received a fine of only £5, but Moseley, who had been most critical of the Governor’s actions, was the victim of a more severe punishment. He was not convicted for breaking into Lovick’s house to examine the records, but for speaking “scandalous words” against the governor. He had been so bold as to criticize Eden for not doing anything about Teach. His fine was set at £100, and he was forbidden to hold any public office for three years. Meanwhile, most of Teach’s crew had met the same fate as their captain. The courts of Virginia had found them guilty of piracy. Thirteen of their number met their end swinging beneath the gallows. Only two escaped the noose. Samuel Odell, who had received over 70 wounds in the fight with Maynard’s men, was one. He was able to prove that he had been forcibly taken from a trading vessel only the night before the battle and had been forced to join Blackbeard’s crew. The other was Israel Hands, whose lameness at the hands of his captain may have been responsible for some sympathy from the judges. He was convicted and sentenced to hang, but while still awaiting execution received word that the King’s pardon for pirates had been extended. His request that he be allowed to take advantage of this was granted. By Hugh F. Rankin, The Pirates of Colonial North Carolina, North Carolina Department of Cultural Resources, 1960. This article was excerpted from The Pirates of Colonial North Carolina, a publication of the Historical Publications Section, Division of Historical Resources, Office of Archives and History, North Carolina Department of Cultural Resources. The author, Hugh F. Rankin (1913‑1989) was a noted historian of colonial America and the American Revolution and a history professor at Tulane University from 1957 to 1983. He was the author or co-author of well over a dozen books on historical subjects and many journal articles. Today, this booklet is in the public domain as its copyright was not renewed. Though the context of the article has not changed, some minor editing has occurred.